You could describe Weh Island as being roughly “U” shaped, with the two struts forming a deep bay. 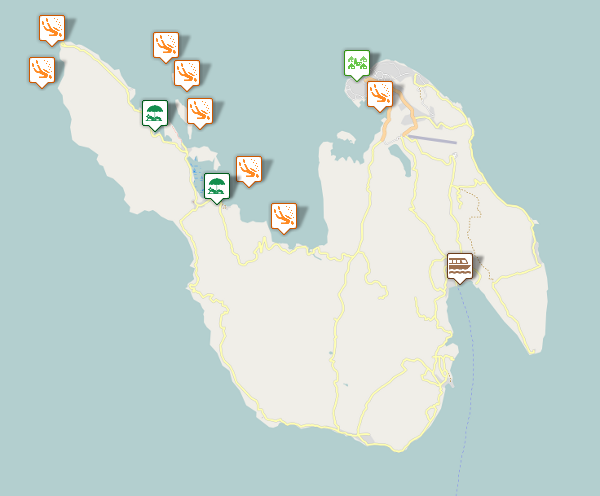 Most of the favored dive sites are along the western side of the bay, and this is where the two developed beaches with dive shops are located, Iboih and Gapang. Move your mouse over the icons to see the labels. Click on a site for more information. Iboih is a bit larger and more developed than Gapang, but the actual beach here is in small patches, rather than Gapang's long expanse. There seems to be only one dive operator in Iboih, Rubiah Tirta. The island's main city is Sabang, on the northeastern tip of the island. In fact, many Acehnese will refer to Pulau Weh as 'Sabang'. There's not much to see or do in Sabang, so about the only reason to go there is if you have a desperate need of an ATM. The only one on the island is there. Most operators seem to do two single-dive boat trips per day (except Friday). The dive sites are generally little more than 15 minutes sailing from either Gapang or Iboih, so boats will return to their base after every dive. They will do one dive in the morning and another after noon. There's usually time for a late afternoon or night shore dive, and if enough people are interested, additional boat dives can be arranged. It's perhaps worth noting that owing to the conservative nature of Aceh province, there's usually no diving on Friday mornings, and shops may not open until after noon prayers. You should also be aware that most shops and restaurants do not sell alcohol.